Mr. Robertson has over seven years of experience as a wildlife biologist and botanist, performing environmental surveys and biological assessments for public and private agencies, along with 25 years of experience teaching environmental courses and conducting wildlife projects at field stations for the University of California, Berkeley. 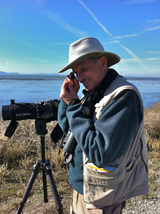 His recent work at CCCI has included wetland delineation, special status plant and animal surveys, vegetation mapping (using GPS and GIS), monitoring migratory bird nesting exclusions, surveying for California red-legged frog and western pond turtles, construction monitoring, and the installation of various wildlife barriers. Mr. Robertson has a wide range of field experience: avian surveys; botanical surveys; live-trapping and tracking of mammals, reptiles and amphibians; forestry surveys; fish surveys; and aquatic and terrestrial insect surveys. He holds a CDFG Plant Voucher Collecting Permit (2081(a)-12-86-V), and a CDFG Scientific Collector's Permit (2310). Mr. Robertson has authored books and written a variety of environmental reports, including botanical surveys, wetland delineations, biological assessments, and select chapters of CEQA documents. He has conducted field work in many western ecosystems and California plant communities, and has taught over 200 field courses in these subjects. Mr. Robertson is also an education specialist and a science curriculum developer. He has worked as a botanist, ornithologist, marine biologist, geologist, and building contractor. As a former training officer for mountain rescue and ski patrol organizations, Mr. Robertson can work safely in many weather and terrain extremes.